toronto, yyz, articles and third party booking sites. 39 Responses to "Third Party Airfare Booking Sites: The Power Rankings - who to trust, who to avoid"
Chris, I just want to thank you for publishing this article on Third Party Booking Service sites. I found the information you provided incredibly helpful. I often wondered how safe some of those sites were, but just didn't have the time or know-how to do the necessary research. Thank you so much, for both this article as well as your regular travel deal alerts. No problem, thanks Lori, glad it helped! There really isn't one site in particular that jumps out as having consistently better prices than the rest all of the time. One of the biggest misconceptions I think people have is that the sites are in control of the prices. The sites are just the messenger. It would be financial suicide for any site to purposefully set their prices lower than the competition on airfares. Many times when a great deal is available on one particular third party site, it will be available on some of the others as well. Ultimately they all download their prices from somewhat similar sources. If you've followed the YYZ Deals blog posts for a while, there are certain third party sites that do get mentioned more often than others. Sometimes it's because they are the only ones showing a great price. Other times it's because they are the first to show it. Expedia, Priceline, FlightNetWork and FlightHub seem to come up the most often in the deal postsl. Thanks for this. Very informative indeed and confirms some of the things I'm careful of such as which currency and extra fees. I've used Ticketpilot.ca in the past. It's usually my first go to. Do you have an opinion on this site? Thanks Anna! I think TicketPilot is just run by one of the many smaller travel agencies in Ontario. Being a smaller site, I haven't seen a ton of feedback on them from Canadians, but I think they're probably OK to use, TICO certified, etc. I think the change fee now (in 2016) for FlightNetwork is substantially more than $100 plus airline change fee. Expedia is terrible. Their "customer service" reps are clueless, even if they could speak English, which many can't. They refuse to take responsibility for the tickets they sell if something goes wrong. In fact, all 3rd party booking sites are terrible. It is easy to get caught between them and the airline, with each saying that the other is responsible for handling the problem. There serve no real purpose, except the to take cut and hike fares. They are also the reason that airlines have turned everything into add on fees - so they can look artificially lower on these sites. They have created a race to the bottom in travel booking. Thanks for this list, I every year I look forward to annual updates. Great work, I never heard of maybe 2/3rds of companies on the list. Another thing puzzles me too- you look at things like cancellation policy, 24hr cancellation or customer service. But we all know that there's only one priority, especially for people who come to this site- find the cheapest airfare. I know that there's no clear methodology to compare sites in this aspect. But there are definitely some trend e.g. while Expedia usually offers good deals on hotels, Cheapoair or Flighthub can beat their prices in 90% of cases or you can always find a flight cheaper than FlightCentre offers. Shouldn't this be main criteria for this top chart? Thanks Chris, As usual your posts are very informative and helpful to travel newbies like me. I have few requests and really appreciate if you can help. Can you please advise or suggest which is the best option to book flights from Asia (India) to Toronto (Canada) as its always tough for me to book flights from India to Toronto using third parties like expedia and local agencies in India due to lack of customer support incase of delays or cancellation of flights in connection. My parents had hard time reaching to Toronto from VTZ last few times due to air India and air Canada connections and no one wants to take the responsibilities and expedia could not help in this regard as well. Lastly, I did posted a request on your FB page, but it never got published. Is there any restriction or moderation before posting on your FB wall..i could comment on other posts..but cannot post my self. Once again..i am big fan of you and you really saved thousands of $$ for the past few years. Grandson: Thanks for the comments. I definitely see your point about prices, and the ability for a booking site to deliver on the best available price is definitely something I factor in quite heavily. I'd say over 95% of great deals posted on here come from sites that are ranked in the Top 10. On rare occasion one of the lower ranked sites is the only one showing a great price, such as Explore Trip. I had no idea you could cancel a "non refundable" flight ticket. How easy is it to do so? Thanks Jenny! Only certain booking sites allow you to actually cancel an airfare without any fee (or a low fee). It also has to be within a certain time period (usually less than 24 hours). Priceline has the best policy for this. Most booking sites do not have this policy and will usually charge a person a lot for cancelling an airfare, no matter how soon after it was booked. For the sites that do allow it, you usually just need to call within the allowed time period. Most U.S. based airlines also have a 24 hour grace period where you can cancel your flight without penalty if you book directly through them. I wanted to add a comment about priceline. Recently another site was advertising a good deal from YYZ to FLL for specific dates. When I went to PL to book those, I saw the price I wanted, I clicked through to get to the payment window and AFTER I entered the credit card info, PL informed me that the price of the flight is no longer available and it is now twice as expensive. Fine, I go out to the search screen and repeat the steps - and to my surprise still see the lower price. Go through the steps again, and AFTER entering the cc info - the flight is no longer available. I understand that prices change, but in my mind, once I am asked for payment info, the tickets should be reserved for me (for 5 or 10 minutes I would think). Apparently they are not with PL. I did the same thing through their app - still see the lower price, and can't book it. I called PL and on their end, they only see the higher price. (I also removed my temporary internet files, used a different browser etc)-. I love PL for "name your own price hotels", but this was an awful experience trying to book a "deal" airfare. I just booked with buymytrip.com, and I had good experience with them. I got the etickets\ itinerary very fast. I also asked a favour to make the receipt separately for my name, and separately for rest of my family and they did. So everything good so far. I know the problem comes when you have to change something, but it's almost the same with all agencies. I read their policies, and I took the risk. Was a good deal. Very informative Chris. I didn't look into this until after I booked with a 3rd party site. I booked with Flight Hub airfare in this case to Orlando, which seemed to offer the cheapest flight, even cheaper than the airline or other 3rd party sites. After booking (too hastily), I searched ? My question is, Can I prevent Flight Hub (or any other 3rd party sites if booked through) from cancelling my flight without proper cause? How? Or any recourse if they did that? Thanks! has anyone booked with clickmytrip.com? i found a great deal via momondo.com which then led me to their site. hoping they are legit! raeleen: That's one that's started popping up recently on Momondo. I think they might be pretty new. I don't know anything about them, other than that they are based in India, and I haven't seen anyone really talk about their experience with them yet I have seen them offering slightly better prices than other booking sites on a lot of searches. 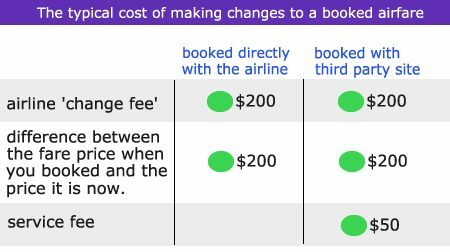 My gut says that they wouldn't be the first choice for booking with, but like all booking sites, as long your ticket is issued by the airline, that is the main thing *unless* you need some sort of help down the line (such as making changes to your flight). You should also always verify that the airline has issued your ticket. If you ended up booking through them and are able to share your experience, please do. Have any booked through this site called www.gate1.ca? Was directed from momondo and they boast some amazing prices (at least 200 cheaper than other sites) but their site looks kind of sketch! Here's some info that I posted about gate1.ca on a recent deal they were showing from Vancouver to Singapore. At the time, they were the only ones showing some pretty incredible prices on ANA from Vancouver to Singapore (other sites would eventually start to show these prices). Later on, a few days after the deal was posted, I heard from from quite a few people in Vancouver that booked the deal on gate1.ca - and who verified their tickets directly on the ANA website using their ticket number. No problems reported. Gate1.ca has no relation to Gate1Travel.com - a somewhat well known tour company in the U.S. I booked a trip through ClickmyTrip, 20 minutes later I got an email saying my payment didn't go through, I called Clickmytrip and they said I had an issue with my credit card, I called my credit card provider, they said Clickmytrip never even attempted to process the payment as they did not see an attempt on their end. I then called Clickmytrip back, and they said oh well your trip is already canceled, nothing I can do. Total scammers, the trip was a pretty good deal so I think they just didn't want to honour the deal, they didn't even put the payment through and acted like it was my credit card issue. I verified everything with my credit card provider. Scammers, don't go through them. Hi Laura, just to let you know you can still book things on Priceline as a Canadian, using a Canadian credit card. You are just charged the amount in Canadian dollars, with an extra 2.5% charge from your credit card company for the foreign exchange. It can sometimes still be cheaper to book on Priceline, even after converting to Canadian dollars and the extra 2.5% foreign exchange charge. I booked my flight from flightfaredeals.com and found the price is 150USD cheaper than unitedairline.com. Is it possible? Justin: It definitely does happen, yep. (A third party booking site being cheaper than the airline's website). Thanks for all the info on the different websites to avoid. Very helpful and was not aware of such hazard. Unfortunately there isn't really a rule of when to book that applies to all origins and destinations. The airlines use sophisticated software to set the prices of each route individually. They try to forecast what price point people will be willing to pay for that route, based on historical and current demand. But if I had to give one overall general rule of thumb, I would say the airlines tend to offer their best prices about 8-12 weeks before departure. Thanks for the article. I had decided to go with Fareboom after reading your article for a trip in Feb. from DFW to Florence, Italy. I tried to call them first to ask a few questions and it kept saying the call didn't go through. So, now I'm even more nervous than before to book anything with them. There price was pretty amazing, though. $750 roundtrip compared to $1500 on the airline. Is that too good to be true? Also, on Momondo, a site called TravelMerry keeps popping up as the cheapest flight. Heard anything on them. I'm booking 5 people and I'm terrified of booking with a dud website! I've seen so many 'too good to be true' airfare prices over the years that turned out to be bookable, that I would never say an airfare price is too good to be true. It's really just a matter of whether the booking site involved can actually get the ticket issued from the airline at the price they're showing. TravelMerry is one that comes up a lot on Momondo when the origin city is in the U.S. (I see them all the time on YVR Deals with deals out of Seattle). So far I haven't heard anyone complain about them - but their website does have the look and feel of the lower quality booking sites. I need to add them to the rankings. Watch out for the fact that TravelMerry is in $USD. All this overload of info makes my brain spin and will to care go out the window. Your post is less than a year old and there are new sights like airtkt.com and justfly.com that are not on your list. It feels so daunting to keep up with it all. AND remember who owns whom and all that. Want to see my sister, can't spend thousands, nervous to take the chance it could be fine or thousands. I'm a whiner!! WAAAHHH. Sorry. ;) also, why don't they take Discover? I thought it was a well used card. I feel like it's as good as a Diner's Club Card!! lol. Anyway. thank you for this article and the explanations. Anyone ever booked with ykca.cheapfaresnow.com? Seeing a much better price with them, but a little hesitant to book with them as I've never heard of them and can't find much info online. Re: Nanak Flights, I had a good experience with them. My flight was set up quickly in the carriers system but it took until the next business day to receive my etickets via email -- that might be a manual process? I had to change my international flight to a different day and was able to get in touch with a person (sometimes that's difficult!) and they were quite responsive (phone, email, text) but I did have to pay change fees. The fees were all bundled together (their fee, airline fee, flight price difference) but I would say they are probably "high" compared to others above. No problem Megz, glad it helped! I also found Nanak Flights fees to be overly high - $145+ increase in fare for changes and $450 for cancellation. Ask up front! I was told it was on the invoice they sent me but that particular invoice was never sent... Having said that, as soon as I wrote to BBB explaining that the fee had never been mentioned, $305 (the agency fee) was refunded immediately. I would consider Nanak again, but only if the flight was a sure thing from my end, covered by travel insurance which this one would not have been. Can you shed any light on budgetair.com? For yul-gru and yul-gig they are consistently charging $60 to $70 less than other travel sites, that's factoring in the easy $15 off coupon with Flight Network. And I've tried with a couple of different carriers. Looking at their price breakdown, the amount for Air Transportation is the same as other sites including the airline's own site, and the taxes fees and charges are exactly the same too. The difference is they have a negative "reservation fee" which varies, usually at least $80 for me. I don't see how one site can consistently charge at least $60 less than everyone else. Is there a catch? The only thing I can figure is that airfares to Brazil are very competitive right now and the airlines are giving this particular travel agency a sizable discount - or else there is some hidden fee coming my way after purchase. I don't care about cancellation or changes, and I opted out of all their extra fees. I used edreams to book 3 flights between countries, singapore, Vietnam, Cambodia, back to singapore. They put someone else name on my ticket and told me they would have it fixed in 3 hours. hour 10 and the flight is about to leave and 15 phone calls later they still didn't fix it. I had to book another flight which cost about 300 singapore dollars one way which should cost 70 SGD. I am calling them a month later about my refund and they are doing nothing.